When we first met Captain Toad back in Super Mario Galaxy, we knew he was adorable, we just didn’t know he’d end up turning into such a star. He got his debut on Wii U and, well, it didn’t exactly sell gangbusters, but the wee Captain certainly earned himself a small but dedicated fanbase. After seeing him back helping Mario in Super Mario Odyssey last year, fans were hoping they’d get more Captain Toad soon. And here he is! Uh, the only thing is that it’s his debut again. Just, like, pretty much the same game but on Switch. So if you haven’t played Captain Toad: Treasure Tracker before, it’s a 3D puzzle “platformer” where you guide the Captain around a selection of what are essentially dollhouse-like puzzle boxes. You can rotate the camera around the box 360 degrees, and using this you can spot where each hidden treasure is in the box, as well as how to get to your end destination. Naturally, getting to the goal is your primary objective, but it certainly shouldn’t be your only objective. Each stage has enemies in, coins, super mushrooms, and precious diamonds. Going into the stage once, you can clear out a majority of the objectives pretty easily, but there are always reasons to go back. Even if you manage to sniff out all three diamonds on your first try, there’s an additional challenge, which could be to find a Golden Mushroom, grab a certain number of coins, or defeat all of the enemies in the stage. It gives each of the stages a much needed bit of replayability, bolstered yet again by an extra challenge on each stage – finding an 8-bit Toad sprite hidden in the level. If you want to go for 100% completion, there’s plenty to keep you occupied in Captain Toad: Treasure Tracker, which is good, because the actual number of levels feels limited. As said, there is plenty of reason to go back to each level, but getting 100% completion on each stage doesn’t necessarily take that long. I almost want to stay in each stage longer, because they’re beautifully designed. No expense has been spared, each level feels small but remarkably polished and beautiful in its own way. And environments keep changing – climbing the inside of a volcano while lava nips at your ankles and climbing the roof of a speeding train going through an icy mountainous region are two different experiences, both thematically and in terms of how you play. But you don’t need to experience Captain Toad: Treasure Tracker by yourself, you can do it with a friend – if you’re ready for some mild awkwardness. Split the JoyCon between you and a friend, and one can navigate the Captain himself, while the other has reins of the camera and can activate touch-sensitive objects and enemies. This can actually work against you – I found myself essentially demanding my friend to put the camera into the positions I want, and ordering them to use the touch controls when I needed. The ability for 2P to shoot at enemies at their leisure is nice though, definitely makes things easier. So, you might be wondering about that touch mechanic I’ve mentioned. Well, on the Wii U you’d use the gamepad to tap away at objects in the environment, freezing enemies and activating certain platforms. Here that is gone of course, but you can use the Switch’s touchscreen, or alternatively, the gyro functions on the pro controller or JoyCon will bring up a crosshair to use, and pressing ZR will act as touching the screen did on Wii U. It’s a small mechanic but has been brought over to the Nintendo Switch incredibly well. 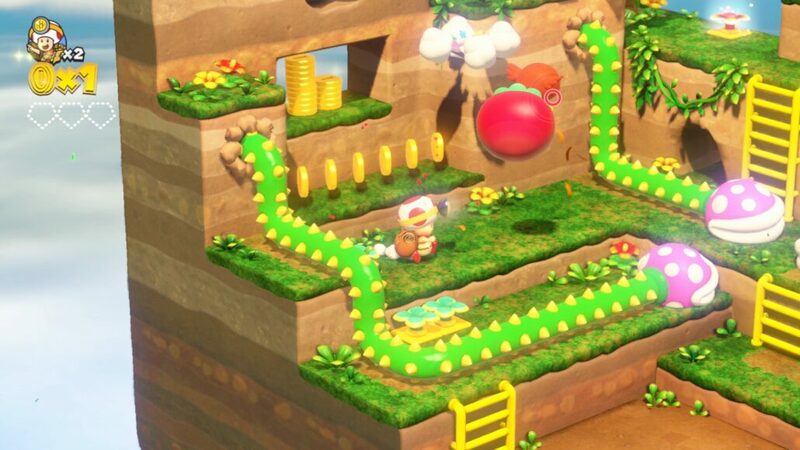 Unfortunately though, if you’ve already played Captain Toad: Treasure Tracker, you might be a bit disappointed by the new content. 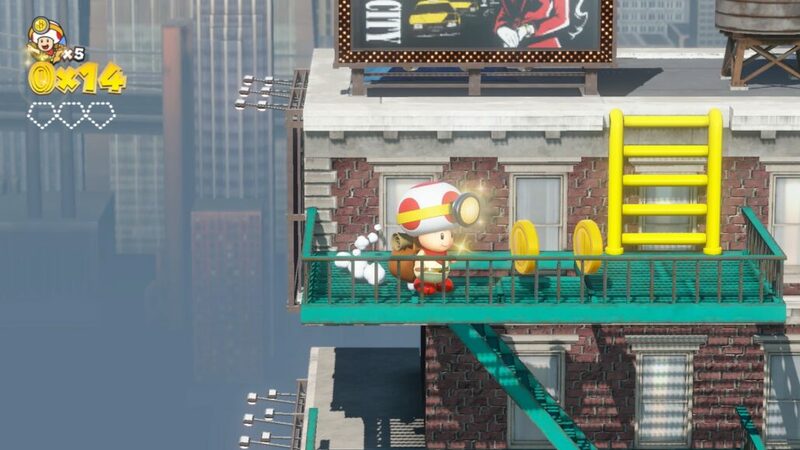 You can now visit some nice Super Mario Odyssey themed stages, but outside of that? Pretty scant, honestly. It’s a shame, but this release is obviously not aimed at those that have played it before, and instead is of course focused on players who didn’t own a Wii U. Sensible, seeing as few of us touched that fabled tablet controller. Reviewed on Nintendo Switch (code provided by the publisher). You can purchase the game via Amazon for Nintendo Switch, Nintendo 3DS or Nintendo Wii U (the old version). Captain Toad: Treasure Tracker is one of the most delightfully charming puzzle games of in recent memory and the dollhouse-style puzzle boxes are wonderful to explore and it's cute and adorable all the way through. Sadly, Wii U owners will find few reasons to pick up this edition of the game, but anyone who hasn't already played Captain Toad will find a puzzle game they'll finish and just want more of.